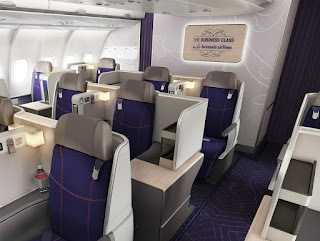 Brussels Airlines has selected ABC International as supplier of cabin branding elements for its A330 fleet retrofit program. The companies first collaborated in 2017 SSJ100 aircraft Brussels took on ACMI basis from CityJet. Brussels selected ABC International because of their “common feelings” and it was “love at first sight," according to a press release from ABC International. Starting from the design concepts of UK-based JPA Design, ABC International translated the "brilliant ideas" into an airworthy product in compliance with aviation regulation. “This project is a further step to cement the relation between two companies that have been sharing a common outlook to the future of cabin interiors industry since the first moment," said Olindo Spatola, ABC International's VP Engineering and Programs. “Brussels Airlines is an ideal partner for developing new products and solutions for cabin branding, considering their continuous commitment in looking for new ways to improve passengers experience and cabin environment. 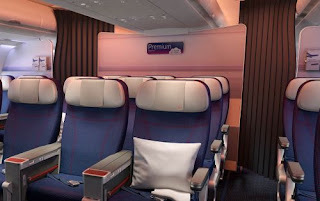 "When the program was launched, all of us at ABC International felt excited for being part of such a challenging cabin retrofit project, as noticed from JPA first design proposals. Furthermore, we had the chance to implement and provide Branding Panels solution with back-lit effect, strengthening our expertise and discovering new materials and design methods." Alessia Giardino, Lead Colour and Materials, Brand and Trends Designer with JPA Design, also commented: “It is always fascinating to collaborate with companies able to transform our concept design in to a real product, combining expertise on technical design and manufacturing processes. We felt immediately comfortable and excited, since the first mock-up, when we noticed ABC International's commitment and passion for cabin branding elements. “It has been a pleasure for all of us in JPA Design to work 'shoulder to shoulder' with them and the final outstanding result reflects the service reliability and the high-quality products ABC International provided to Brussels Airlines during the whole project." 1. Two panels in the entrance area welcoming passenger on board made of “wooden-effect” polycarbonate by Sekisui with “Art-Nouveau” pattern made of a combination of different materials and technologies developed. 3. Two panels in the Premium Economy area and one panel in Economy Class area made with CNC machined aluminum frame covered by special stickers and resin decorative elements displaying various customized themes. Eric Kergoat, Brussels Airlines' Head of Product Development and the person responsible for the cabin branding project with ABC International, said: “We were already aware of the high-quality service provided by ABC International and we felt even more confident after seeing the great commitment in caring all the details since the early stage of the discussion. Brussels Airlines is recognized for being extremely focused on providing an excellent flight experience in an outstanding environment; partnering with ABC International to enhance our brand image is the right way to keep that promise. Investing in cabin interiors have become one of the main key strategies to enhance passengers needs and expectations; with ABC International, we know we are doing it”. The Brussels Airlines A330 cabin branding elements will be showcased at ABC International's Aircraft Interiors Expo booth, stand 6A79, Hall B6, from April 2 to 4.